Samoa offers visitors the chance to experience Polynesia at its most authentic. The capital, Apia, lies on the beautiful north coast of Upolu, the largest and most populous of the country's nine islands. In the Aleipata district, waterfalls and white-sand beaches dominate the landscape. A 65km (40 mile) drive from Apia leads to the Falefa Falls, Mafa Pass and the Fuipisia Falls. 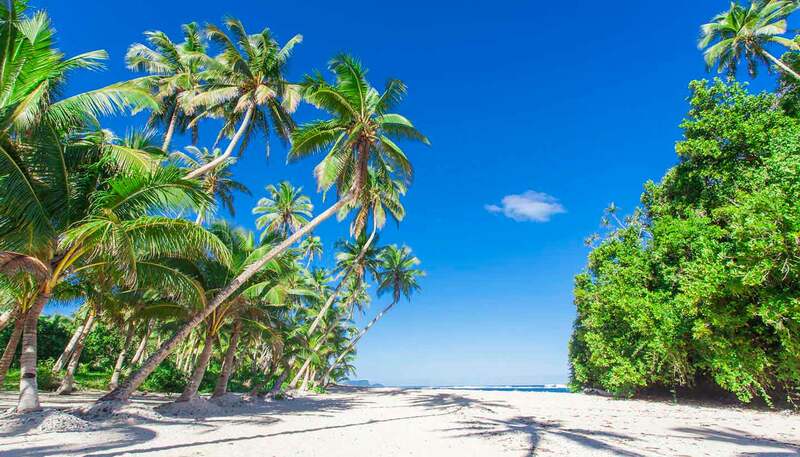 Indeed, Samoa's natural attributes have an intoxicating effect on first-time visitors – islands' teeming jungles, mighty waterfalls and stunning sea have won many a tourist's heart. Thankfully, there are no colossal resorts to mar this landscape, while the locals are humble and welcoming. For the closest thing there is to earthly bliss, head to Savai'i, a veritable land before time, only a stone's throw from the relative civilisation of Apia. The fa'a Samoa (the Samoan way) is arguably the most vibrant living culture in Polynesia, with a heritage that dates back 2,000 years. Only a small nation, Samoa is nevertheless the heart of Polynesia both culturally and, indeed, geographically. Compared to almost any other Pacific island, its hangs on staunchly to the traditional Polynesian way of life. Efforts by 19th-century missionaries sought to challenge the time-worn ways of the Samoans, to little effect. Ruled by both Germany and New Zealand in the 20th century, Samoa gained independence in 1962. The Scottish poet and novelist, Robert Louis Stevenson, spent his final five years living on the island – his tomb on Mount Vaea is visible from the lawn of his house, now a museum. That Samoa must have influenced Stevenson's most famous book, Treasure Island, hardly needs saying. Samoa is as isolated as it is enticing, much-loved of the adventurous and with a rich, precious culture to boot. There are few destinations as unique as this one. 2,831 sq km (1,093 sq miles). Tuiatua Tupua Tamasese Efi since 2007. Prime Minister Tuila'epa Sailele Malielegaoi since 1998. There’s no resident British diplomatic mission in Samoa. Consular support is limited in Samoa. However, the British High Commission Wellington in New Zealand can provide consular support to British nationals. UK health authorities have classified Samoa as having a risk of Zika virus transmission. For information and advice about the risks associated with Zika virus, visit the National Travel Health Network and Centre website. Most visits to Samoa are trouble-free but incidents of petty theft do happen from time to time. The level of serious crime is low, but incidents of petty theft are fairly common. Don’t leave your belongings unattended. Use hotel safes for passports and valuables. Samoa switched to driving on the left in 2009, however, many vehicles still have the steering wheel on the left of the vehicle. You should take care when driving on the roads, observing speed limits. You should avoid driving at night out of built-up areas. Vehicle safety regulations are not consistently enforced and traffic violations occur routinely. Roads in Samoa often cross small streams. Take care when crossing these streams. Tide changes can produce powerful currents in ocean lagoons. Take local advice before swimming. Fatal accidents have occurred at popular beaches. Although there’s no recent history of terrorism in Samoa, attacks can’t be ruled out. Despite examples of men cross-dressing and behaving in a feminine manner, homosexual acts in Samoa are illegal. See our information and advice page for the LGBT community before you travel. There are strict regulations concerning the import of firearms, plant and animal products, pets, drugs and pornographic materials. Visas are not required for stays of up to 60 days. As a visitor you must have an onward or return ticket and a valid visa (if required) for the next country to which you are travelling. Requests for an extension of your stay must be made to the local Immigration Office. Further information on entry requirements can be found on the Samoa Immigration Department’s website. A visa is required for visits of longer than 60 days. Applications for visas can be made at Samoa’s overseas missions in Brussels, Wellington, Auckland, Canberra or New York, or to the Immigration Office at the Prime Minister’s Department (PO Box L1861, Apia, Samoa). Your passport should be valid for a minimum period of six months from the date of entry into Samoa. All visitors (including children over 11 years) are required to pay a departure tax of $ST 40. UK Emergency Travel Documents (ETDs) are accepted for entry and exit from Samoa. Your ETD must be valid for at least 6 months. Check the latest country-specific information and advice from the National Travel Health Network and Centre (NaTHNaC) on the TravelHealthPro website or from NHS (Scotland) on the fitfortravel website. Useful information and advice about healthcare abroad is also available on the NHS Choices website. Health care facilities in Samoa are adequate for routine medical treatment, but are limited in range and availability. Doctors and hospitals often expect immediate cash payment for health services. In the event of a medical emergency, evacuation to Australia, New Zealand or Hawaii is likely to be the only option for treatment. You may find it hard to get some specialised prescription medicines in Samoa. Cases of dengue fever have been confirmed in Samoa. You should take steps to avoid being bitten by mosquitoes. Water-borne, food-borne and other infectious diseases (including typhoid, hepatitis, filariasis and tuberculosis) occur. If you need emergency medical assistance during your trip, dial 996 and ask for an ambulance. You should contact your insurance/medical assistance company promptly if you are referred to a medical facility for treatment. Samoa is located in a seismic zone called the “Ring of Fire” and is subject to earthquakes. An earthquake of magnitude 8.3 struck Samoa on 29 September 2009, which triggered a devastating tsunami. The tropical cyclone season normally runs from November to the end of April. Flooding can occur. Monitor local and international weather updates from World Meteorological Organisation (WMO), the Samoa Meteorology Division website or the Fiji Meteorological Service website. See our tropical cyclones page for advice about what to do if you’re caught up in a tropical cyclone.